For other uses, see Do Ab. 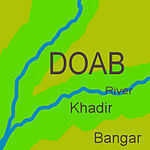 Doab (pronunciation IPA:d̪o-ɑːb) is a term used in South Asia for the "tongue," or tract of land lying between two converging, or confluent, rivers. It is similar to an interfluve. In the Oxford Hindi-English Dictionary, R. S. McGregor defines it as "(Persian do-āb: a region lying between and reaching to the confluence of two rivers (esp. that between the Ganges and Yamuna)." The Doab or the Ganges-Yamuna doab designates the flat alluvial tract between the Ganges and Yamuna rivers extending from the Sivalik Hills to the two rivers' confluence at Prayagraj. The region has an area of about 23,360 square miles (60,500 square km); it is approximately 500 miles (805 km) in length and 60 miles (97 km) in width. 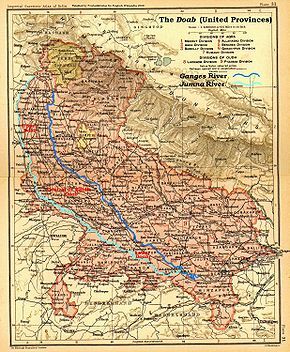 The British raj divided the Doab into three administrative districts, viz., Upper Doab (Meerut), Middle Doab (Agra) and Lower Doab (Allahabad). Etah, Kasganj, Aligarh, Agra, Hathras, Firozabad, Farrukhabad, Kannauj, Mainpuri, Etawah, Auraiya and Mathura. Mathura is in the trans-Yamuna region of Braj. Kanpur, Fatehpur, Kaushambi and Prayagraj. A map of the Punjab region ca. 1947 showing the different doabs. The Sindh Sagar Doab lies between the Indus and Jhelum rivers. The Jech Doab (also Chaj Doab) (small portion of the Jech Doab is Majha) lies between the Jhelum and the Chenab rivers. The Rechna Doab (considerable portion of the Rechna Doab is Majha) lies between the Chenab and the Ravi rivers. 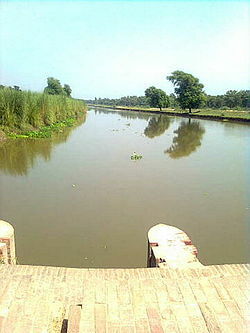 The Bari Doab (considerable portion of the Bari Doab is Majha) lies between the Ravi and the Beas rivers. The Bist Doab (or Doaba) - between the Beas and the Sutlej rivers. The rivers flowing through the Malwa region, covering current states of Madhya Pradesh and parts of north-eastern Rajasthan, also has doab region such as Upper Malwa doab and Lower Malwa doab. The Raichur Doab is the triangular region of Andhra Pradesh and Karnataka states which lies between the Krishna River and its tributary the Tungabhadra River, named for the town of Raichur. Since North India and Pakistan are coursed by a multiplicity of Himalayan rivers that divide the plains into doabs (i.e. regions between two rivers), the Indo-Gangetic plains consist of alternating regions of river, khadir and bangar. The regions of the doabs near the rivers consist of low-lying, floodplains, but usually very fertile khadir and the higher-lying land away from the rivers consist of bangar, less prone to flooding but also less fertile on average. Khadir is also called Nali or Naili, specially in northern Haryana the fertile prairie tract between the Ghaggar river and the southern limits of the Saraswati channel depression in that gets flooded during the rains. Within bangar area, the Barani is any low rain area where the rain-fed dry farming is practiced, which nowadays are dependent on the tubewells for irrigation. Bagar tract, an example of barani land, is the dry sandy tract of land on the border of Rajasthan state adjoining the states of Haryana and Punjab. Nahri is any canal-irrigated land, for example, the Rangoi tract which is an area irrigated by the Rangoi channel/canal made for the purpose of carrying flood waters of Ghagghar river to dry areas. Historically, villages in the doabs have been officially classified as khadir, khadir-bangar (i.e. mixed) or bangar for many centuries and different agricultural tax rates applied based on a tiered land-productivity scale. Interamnia, an ancient Latin placename, meaning "between rivers"
^ a b doab or duab, n., OED Online, Oxford University Press, March 2014, retrieved 24 April 2019 Quote: "Originally and chiefly in South Asia: (the name of) a strip or narrow tract of land between two rivers; spec. (with the) the area between the rivers Ganges and Jumna in northern India." ^ doab or duab, n., OED Online, Oxford University Press, March 2014, retrieved 24 April 2019 Quote: "confluence, land between two rivers, used in India of the tongue of land between the Ganges and Jumna, and of similar tracts in the Punjab, etc., lit. ‘two waters’ "
^ Doab., Webster's Third New International Dictionary, Unabridged., 2013, retrieved 24 April 2019 Quote: " a tract of land between two rivers : interfluve"
^ McGregor 1993, p. 513. ^ a b c Ganges-Yamuna Doab, Encyclopedia Britannica. ^ "Archaeology Of Lower Ganga-Yamuna Doab 2 Volumes". ^ a b c Kakshi, S.R. ; Pathak, Rashmi; Pathak, S.R.Bakshi R. (2007-01-01). Punjab Through the Ages. Sarup & Sons. ISBN 978-81-7625-738-1. Retrieved 12 June 2010. ^ Damage to Yamuna Khadar, Ravi Shankar's Art of Living Responsible: NGT, Khas Khabar. 7 Dec 2017. ^ a b E. Walter Coward, 1980, "Irrigation and Agricultural Development in Asia: Perspectives from the social sciences", Cornell University press, ISBN 0801498716. ^ 1987, "gazetteer of India: Hisar District" Archived 1 May 2014 at the Wayback Machine, page 7.